I have had several questions about the interior borders of tables as we have moved to Moodle 2.1 from 1.9. In the new HTML editor is not as clear how to edit table properties and the default table border color for interior borders seems to be set to white. Once you have a table there are a lot more options, but you have to right click on a cell when editing a cell. Then you get a whole menu of options. The screen cast allows you to see how to change the default color of you borders to black in the table you are working on. 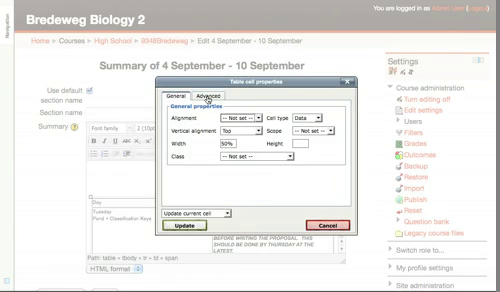 Any way to toggle between teacher view and student view in Moodle when I'm logged in? Am I missing something? I searched and searched for the relocated location of this incredibly popular and important peice of a moddle course that allows a teacher to see what a students would see. This setting has moved from a menu at the top to a menu in the side bar below the Edit Settings link. See the attached screen shot. I am upgrading the schools Moodle server this week. 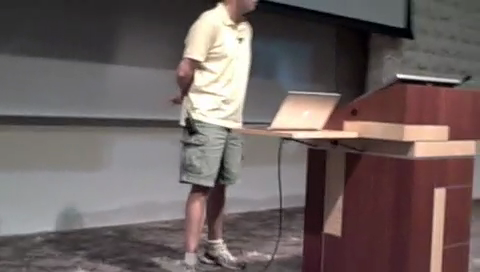 We were using Moodle before Moodle was cool. The very first course ever created in our Moodle was Peterson Independent Research in Physics. I love Moodle. It is the perfect mix of teacher and school terms, ease of use and student flexibility. It is the glue that holds together our one-to-one MacBook program. Teachers feel comfortable moving their lessons into Moodle. They get it right away. They have this blank nice looking page, and they add familiar items like assignments and resources and quizzes. At my first ever whole faculty training on using the Moodle quiz module I spent the first hour trying to move the teachers off from the idea that you had to use it for quizzes. I had them brainstorm other uses for it. I showed them ideas I had been using in my classroom with pre-assessment and formative assessment. Wednesday I am pulling the plug on Moodle 1.9.9 and moving to Moodle 2.1. This is not an upgrade for the feint of heart. As part of this upgrade there is huge change in the way the quiz engine works, and I was presented along the way with a statistic. In all the years we have had Moodle it has stored every quiz attempt ever taken. This sits in our database, and the total attempts at quizzes are 2,500,000. Our school mission is, "Equipping minds and nurturing hearts to transform the world for Jesus Christ." My question: would we have advanced our mission more by giving 2.5 million quizzes, or if we had instead applied our learning to make 2.5 million edits to the Wikipedia? Dan and I had dinner with a guys last night from Aspen Learning. Here is in a nutshell what they sell. A 1U server that runs a very modified Moodle with other open source software and SMB. You plug it into you network and upload a .csv of users, passwords and emails, and you have a server for file storage, classroom activities, blogs (they do not use the moodle blog server) and everything else you need to have a good one to one program. Pretty cool technology. By the way, when I talked about funding for their company the guy told us he was at Apple and presented an intelligent keyboard to their product people 15 years ago. They did not want to market it, but they allowed him to start his own company. He named it AlphaSmart. This company is what he started when he sold AlphaSmart.